Music therapy is not just for people who ‘need therapy’, but it can be a successful tool to bring people together. We are regularly approached by companies and charities looking to integrate music therapy into their team building programs. Music is personal to each and every one of us, and there is a common misconception that you must be ‘musical’ to have music therapy – which is definitely not the case! It can be extremely daunting to engage in any activity with either a new team, or people that have known each other for years, and team building pushes people out of their comfort zones and enables communication and expression on a different level. Team building sessions use music to introduce and settle teams slowly to build confidence and create group cohesion, and to release frustrations and work through problems so that tasks can be undertaken more efficiently and collaboratively in the work place. Team building sessions can be undertaken in a wide variety of settings – from healthcare to business settings, and it is not necessary for your team to work in the caring professions for a music therapy team building day to make an impact! Team building events are built according to the specifications of your needs. Please make an enquiry to discuss your interest. Music therapy is not a vastly well known profession, therefore we regularly run CPD workshops, lunches, days etc to provide information and insight into music therapy. Alongside increasing general awareness of music therapy and its uses, a CPD event can enable staff to pinpoint clients and service users who may benefit from music therapy or other arts therapies, and also to teach basic principles and skills so that staff are more confident and competent to use music in general activities within their sessions. CPD events are built according to the specifications of your needs. Please make an enquiry to discuss your interest. 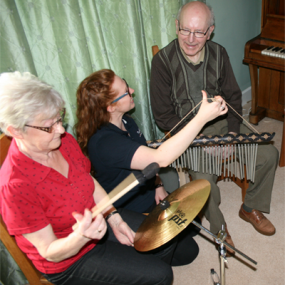 MusAbility provides workshops to settings that employ our music therapists as a standard practice – it is essential that staff understand music therapy and know what it roughly entails in order for them to support clients, service users and groups undertaking music therapy. 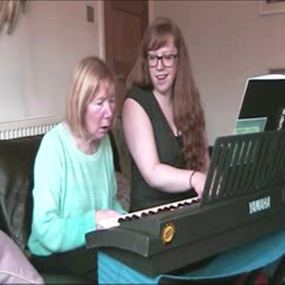 In other settings, where a music therapist is not currently employed, workshops can provide an insight into music therapy and its principles so that staff can refer clients to services that they need more effectively, and learn basic techniques and gain confidence in using music within their settings. Workshops can range from a simple presentation, to a full day of theory and experiential music-making. Workshops are built according to the specifications of your needs. Please make an enquiry to discuss your interest.